Phillip King, 49, is calling on the district council to improve disabled access to the seafront. As a paraplegic, he is reliant on his wheelchair to travel around Bognor, where he has lived for the past two years with his partner Kristina, who is also wheelchair bound. Without a ramp or mats to the beach itself, Mr King said he is simply unable to get on to the beach or swim in the water, something he would very much like to be able to do during the warmer weather. He said the sailing club had a ramp for boats and something similar could be installed on a smaller scale to prevent the ‘very frustrating’ experience. This would help parents with pushchairs as well as older people or those with mobility issues. Other issues he said wheelchair users faced in the town were the single space for wheelchairs on buses and cracks and bumps in the pavements that could throw a person from a chair. 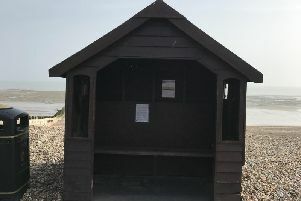 A spokesperson for Arun District Council said it was ‘open to any practical solution or suggestion’ to improve disabled access but it had already looked into options such as a ramp, matting and beach wheelchairs. Drawings for a beach access ramp were abandoned after coastal engineers found the ramp would ‘become blocked with shingle in such a short period of time as to make it unviable to construct’. Beach matting and beach wheelchairs have also been ruled out as suitable for use only on flatter, sandy beaches. She said: “The problem at Bognor Regis is that although most people with limited mobility, particularly those in wheelchairs, will descend on matting quite easily, there is a real concern that they will not get back up again when the tide changes and/or they choose to leave.